With immense support and rich experience, we are engaged in offering a comprehensive range of Concentric & Eccentric Reducers. 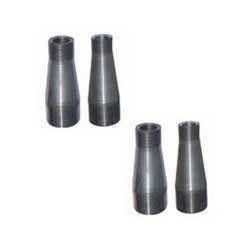 These concentric & eccentric reducers offered by us are applicable in a number of sectors such as petrochemical, power, nuclear and electronic industries. Our personnel ensure to made this range precisely so as to ensure its close tolerances. In addition to this, the offered range is best suited for critical applications that involve high pressure, impulse, vibration and temperature.